I'm wondering if Sweet Spots Ti is going to be worth the extra money vs. some other vendors Ti Grade 1 wire (those that market to the vape community). I have some of the 0.5mm wire and it performs very good. However, there has been discussions stating its not worth the extra money vs regular grade 1. This, as far as I can tell, is based on one or two guys on ECF with "supposed" experience in the wire industry debunking the validity of their product. What I have found is the guys at Sweet Spot Vapors document that the wire is grade 2 Titanium which has been prepared with "their unique process" for vaping. Their statement is that the elements found in the grade 2 Titanium alloy is better suited for temperature control and hence their unique wire curve. Also, I'm coming from the nickel school of DNA Temp control. I like the experience with titanium so far. I'm just not sure how long these coils can go before they need to be replaced. Nickel usually malformed from wick changes way before they didn't perform. Let me know if it is OK with forum protocol to ask about specific manufacturers. i can't speak for SSV Ti but i can say regular grade 1 Ti works just as good and it's cheaper per foot. i bought a 15 ft spool of 26g spider silk by envy. i overpaid for the wire, that's for sure. i however, set up an atty with it and leave it. i just change the cotton and clean the coils. i bought that spool, they call it a puck, back in may of 2015 and still have more than half of the wire left. i don't use nickel anymore. most of my rta's and rda's have Ti builds in them. a couple have nife48/52 and a couple have SS builds. not a fan of SS that much except for the fact i can run it in power or TC mode. I'm definitely going to order some regular Ti1 from another reputable source and give it a try before anther SSV order. looks like I need to explore some of the nickel alloys that are coming back into vogue. so how do you clean the coils? Personally I do not see a way to clean them. I use spaced coils and do not dry burn/glow them before use. I have gone through a few coils and have tried "cleaning" only once. I used a small hard bristled brush/tool with no luck. A low wattage (8-10w) pulse to glow them resulted in a small appearance of ash which I wiped off using a paper towel. With a kanthal coil, I'd have a reasonably good idea that it was incinerated juice residue. With Titanium, TiO2 maybe, or something else I do not know. Mine are not gunked up; they are simply black as apposed to shiny. After the slow glow, the coil appeared to be a shiny black reflecting light. Cleaning with a towel or small brush only gets the outside of the coil, so not a renewed coil. I have looked for information on Ti coil heath and appearance with no luck. Maybe some of the Early, Early adopters could chime in. what i do when cleaning my Ti coils. 3) take mod out of tc and into reg vw mode. set at 15 watts. 4) fire the coils until they glow a dark red, anything brighter and a ti dioxide layer forms, ruining the coil. 5) when coil is red, while still holding the fire button, dunk the coils into little cup of water quenching the coil. shocks the crust right off the coil. i do this "quenching" method as many times as i need to get crust off my coil. it works surprisingly well. i've had the same dual Ti coils (cotton changed every 4-5 tankfuls) in my goblin mini for over 9 months now. vapes just as well from when i first put them in, i think. i don't exactly remember how good the flavor was on day one, but it's still good today! First of all, SSV's wire is not grade 1. And second of all, no it is not worth the money. Thanks for the cleaning info Chunky. First - why would it matter what grade it is? As far as I'm aware, the grading isn't based on applicability for vaping; wouldn't a more suitable question be: is the SSV wire better or worse for the properties we require for vaping than a grade Ti 1 alternative? Secondly - why don't you think its worth the money? How did you compare SSV Ti wire and grade 1 Ti wire? What was different about their performance and why did you prefer grade 1? The grade doesn't matter for advanced users (like most of us DNA-200 users), but it does matter for new TC users who buy SSV Ti wire and throw it on their Joyetech TC mod. It's not going to work at all. New users will be forced to go hunt down the SSV TCR value, which they probably aren't going to do. Because I can buy grade 1 Ti wire all day for about $10 for 50 feet. SSV charges, what? $1 per foot? Grade 1 is the purest commercially available and thus it will be the closest to the TCR values found in scientific literature for pure titanium. Grade 1 is the purest commercially available and thus it will be the closest to the TCR values found in scientific literature for pure titanium. That makes perfect sense when comparing with titanium without a dedicated csv, but the point I'm interested in is whether SSV's csv really works nicely with their wire and whether it does make any discernable difference to the vaping experience when compared to grade 1 titanium. Titanium wire hasn't been easy for me to find so I'm not sure about the price comparison for myself, I may try to find some while I'm in Canada (one more week but I'm in a small town in the mountains). I actually found SSV wire in the UK and while it wasn't cheap, it cost less than a pack of cigarettes so I took a gamble on it - I've yet to try it. I will keep looking for some grade 1 titanium to compare the SSV wire - but I'm always looking for opinions and experiences of others. 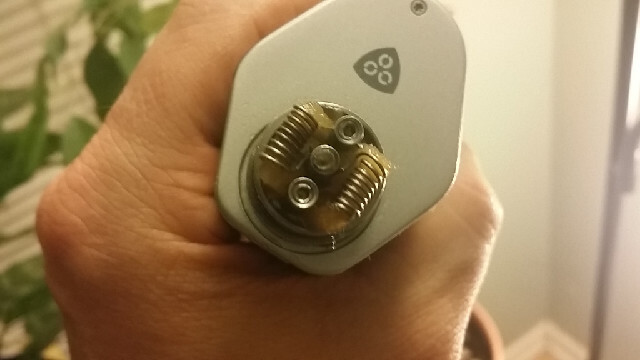 I like the SSV wire. Yes it is an alloy, but with the right profile, it is a great vape, easy to work with and durable. If I could find annealed Ti that I could bend and have it stay that way, I might switch, but having used pure Ti and having four Ti ignitions (the Ti burns) in my atomizers, I have been reluctant to go back to it. Viruk StealthVape.co.uk do quality grade 1 Ti in the UK, I prefer their NiFe30 myself, choose rebuildable supplies shipping and look around the site there are a couple of freebies you can add to your order. 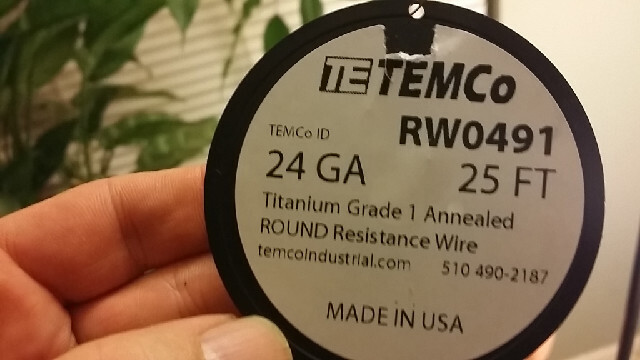 I decided to try some Temco Ti grade 1 wire. This is annealed wire, which I did not notice when I ordered it. I searched all over the forums for info on Temco titanium wire and found no mention of it other than questions being asked which were completely ignored. So, for $6 wire (25ft/24awg), I thought why not. The wire arrived and was slightly dull silver in color and not shiny like some of the other Ti wire being sold as vape specific or"specialty". The color/appearance would be due to the TiO2 layer and was otherwise clean and not as oxidized as some of the reference pics I have seen. 1. I cleaned the wire with alcohol/cotton and wiped it dry before use. 2. loaded the Steam Engine CSV for Ti grade 1. I could not find any other standard Ti CSV files for testing as those that have been discussed were pointed towards dead links. With a temp limit of 420 degF: Temperature went to limit within 1 or 2 2second pulls. Bumping the temperature limit up to around 480 seemed to work better where I could take several (4 or 5) 2-3sec pulls, but the DNA 200 was pulling the wattage back some to keep it there. 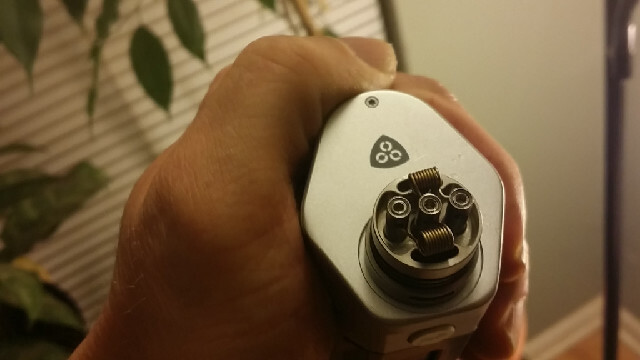 Neither set of coils seemed to have the perceived power of SSV Ti using the same settings. Also, the SSV wire hit temperature as I would have expected, when the cotton began to become dry from use, whereas this wire had the tendency to hit the temp limit quickly. Obviously I will need to order non-specialty Ti grade 1 wire from a few other vendors to know how Ti is going to perform. For me the SSV Wire works very well, but I would like to have a less expensive option. Also, from what I have gathered, grade 1 Ti is not commercially available as 100% Titanium and is only 99.2-99.5% pure. I have seen the 100% pure and surgical grade descriptor thrown around by a several vendors. The surgical aspect would certainly appear to be simple marketing, as all grade 1 Titanium is surgical grade as are several other grades of titanium. So for now, I'm going to leave this wire alone, at least until I find out if this is safe to use or not. As a quick update: After letting the mod sit for a while with the Ti wire build in it, the DNA board seems to have "refined" itself. The vape seems to be working fairly well @ 480 deg F. and is not having to pull back the wattage to stay below temp. Still I would like to find out how this particular wire will perform over time and also how safe it is to use.